Don H. asks: Do car blinkers click naturally or is there some mechanism added to make the clicking noise to let you know your blinker is on? Motor vehicle directional signals have been around almost as long as cars, and as early as 1909, a device was patented that had hand-shaped lights that indicated to other drivers which way a vehicle intended to travel. Obviously, that one didn’t catch on. Neither did the mechanical signaling device invented by silent-film star Florence Lawrence in 1914, which, after a button was pushed by the driver, a sign would pop up from the rear bumper indicating which way the car was turning. The first modern directional signal was patented in 1925 by Edgar A. Walz, Jr., although no one was interested in it either, at least until after his patent expired 14 years later. That’s when, in 1939, the U.S. automaker Buick first introduced the “Flash–Way Directional Signal,” which operated in the familiar way – a stick, mounted on the steering column. In its original incarnation, this turn signal only flashed the rear lights; by the next year, front lights were flashing as well. By the end of WWII, directional signals were standard in most American automobiles. While there are several different designs out there for turn signal switches, they classically used some form of a thermal switch (in this case called a thermal flasher). The core of this switch includes a resistor that heats up when current flows through it. This is attached to a bimetallic spring- essentially an arched strip made up of two sandwiched metals with very different thermal properties, one that expands quite a bit as it warms and the other that doesn’t. The result is that when current is flowing (when you turn on the blinker), the resistor heats up the arched bimetallic spring which in turn is connecting the two terminals, allowing the lights to come on. As it heats up, one of the metals begins to try to straighten itself out as it expands, but initially can’t because the other metal is holding it in its arched form. Eventually, the heat builds enough where the metal trying to straighten itself out wins the battle and the bimetallic spring straightens, disconnecting the two terminals. At this point, no electricity is flowing and the lights are off. Because no power is flowing, the resistor and the bimetallic spring rapidly cool to the point where the other metal pressing to reform itself into the arched shape wins, and there is another snap as it once again bends back into shape and re-connects the terminals, starting the process over again. So in these thermal flashers, the clicking noise you hear is just this bimetallic spring snapping back and forth from its arched form to a straightened form and back again. One tell-tale sign that you have a thermal flasher in your car is that when a light goes out, the flash rate of your blinkers will slow down- less electricity = more time needed for sufficient heat to build to snap the spring. In the extreme, where too little current is flowing (like if you try to swap out your incandescent bulbs for LEDs), your blinker will simply not blink, staying on. On the other end of the spectrum, if you hook up a trailer or something with more lights, it will speed up the blinking rate and in the extreme perhaps even damage your thermal flasher. Another common device used to create the blink in your blinkers is an electronic flasher. Instead of using heat and a bimetallic spring, this device simply uses some electronic circuit to control a relay. Inside a mechanical relay, applied electricity to an electromagnet creates a magnetic field that switches a metallic armature, which in turn makes an audible clicking noise. When the electricity is no longer applied to the electromagnet in the relay, a spring moves the armature back the other way, either connecting the circuit or disconnecting depending on the type of relay (whether it’s designed to be switched on or off by default). This type of system has the advantage of not inherently changing the blink rate based on the electrical draw of the lights. So switching to LED lights or hooking up trailer lights won’t necessarily affect anything, though this does vary somewhat depending on the design of the circuit, particularly in how the system is designed to detect and respond to a burnt out light bulb. But, in general, as long as you’re not drawing more power than the wires, fuse, etc. can handle, the system should blink at a constant rate, with the relay clicking away as it switches the lights on and off. There is also another type of electronic flasher that is a solid state flasher, meaning it has no moving parts (making it incredibly long lasting and reliable), perhaps using a solid state relay. 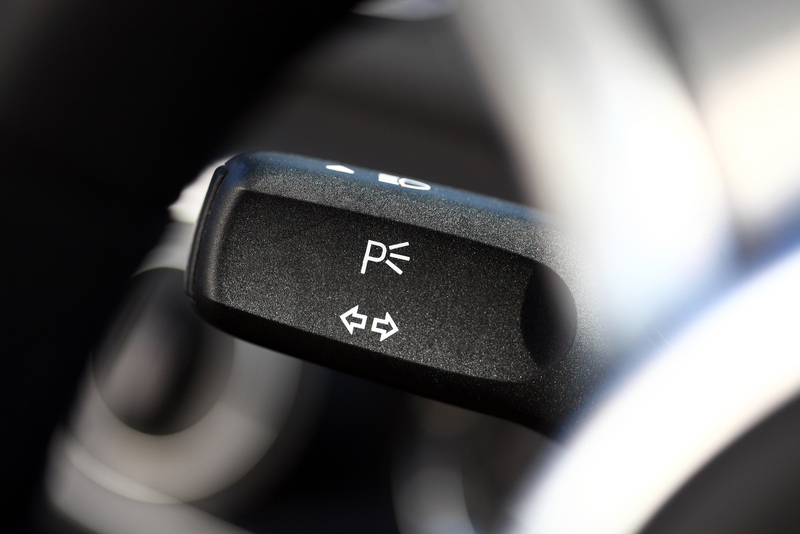 This type of system does not inherently click unless the designer specifically chose to add something to do so, possibly added as an extra indicator to the driver that the blinker is on. In most cases, though, there will be no click with a solid state flasher. According to the National Highway Transportation Safety Administration (NHTSA), nearly 30% of all crashes are rear-end collisions, and 40% of all crashes occur at intersections- both driving situations where directional signals would help – if only people would use them. In a comprehensive field study of observed turning vehicles, more than 25% of the time the driver neglected to use a turn signal when required; even more shockingly, the researchers also found that when vehicles changed lanes, nearly 50% of drivers didn’t use the appropriate turn signal. According to the researchers, with just a 25% neglect rate, given the average annual driving patterns of Americans, this would compute to 750 billion times each year that drivers place themselves at greater risk for a crash by not using their turn signals. In the United States, more than 50% of people killed in car crashes were not using a seatbelt or other restraint; in 2009, this worked out to nearly 17,000 deaths. Nonetheless, seat belt use has significantly risen since serious policy efforts were established to encourage use; for example, only 11% of Americans regularly used seatbelts in 1981, but nearly 85% do so today. Seat belts cut the risk of injury from a crash by 50% and the risk of death by 45%. People who don’t wear seat belts are 3000% more likely to be thrown from the vehicle than those who do – and those who are ejected during a crash have only a 25% survival rate. In 2012, more than 400,000 people were injured, and more than 3,000 killed, in car crashes involving distracted drivers. This works out to more than 1,100 injured and 9 killed each day in the U.S. Those under age 20 are the most likely to engage in distracted driving, and 25% of teen drivers text at least once during each trip, and 20% claim they message multiple times. In addition, while people in their 20s comprise 27% of all distracted drivers in fatal crashes, at least 10% of older drivers admit to texting as well. Furthermore, 69% of drivers aged 18-64 admit to talking on their cell phones while driving, which has also been shown to increase the chances of an accident. At any given moment during the day in America, more than 650,000 drivers are either manipulating an electronic device or a cell phone. Reaching for, dialing and texting on a phone increases the risk of having a wreck by 300%. Notably, drivers in many other western countries refrain from distracted driving, and only 21% of UK drivers even talk on the phone while driving, and only 15% of Spanish drivers text while driving. Currently, 45 states, the District of Columbia, Puerto Rico, Guan and the U.S. Virgin Islands all ban texting while driving. Those states that don’t are Arizona, Missouri, Montana, Oklahoma, and Texas. Each time a driver texts, her eyes leave the road for an average of 5 seconds; travelling at 60 mph, that blind driver will have travelled 440 feet – the length of nearly 1.5 American football fields. What causes the clicking sound when I turn on the blinkers? Where is the turn signal noise generated in your car? They don’t and they can’t. Car flashers turn off when the wheel is positioned back straight. That’s fairly easy fact to detect using a very simple sensor. Wheel straight – turn ended – flasher off. For motorcycles this is impossible because turns are not done by noticeable handlebar rotation, but by leaning. Leaning is considerably harder to detect, so nobody, as far as I know, went to the trouble. It’s not even a sensor as such, it’s a mechanical setup that physically pushes the turn signal switch back to the “off” position as the wheel is unwound. Basically a nub on the steering shaft itself that pushes against an internal extension of the signal lever. On my 2009 Saturn Aura, the “blinking” noise comes over the front left speakers. If I am on the car’s Bluetooth, making a phone call, you will not hearing the noise. Same thing if you have the hazards on, and open the door. The door chime will cancel out the blinking noise. On both my cars, if I leave the blinkers on, I will get an audible alarm alerting me that they are still on. Sometime in the late forties or early fifties, an English friend of my father’s had what we Americans called an English Austin. It had little arms that could be raised on either side to signal a turn. I suspect they were raised mechanically rather than electrically. Those were the first turn signals I remember seeing on a car.